Having been much impressed by tales of teen and pre-teen girls inventing all sorts of life-improving doo-dads, my family is very much on board with getting Halle and Zanna interested in S.T.E.M. (Science, Technology, Engineering & Math). So for Christmas/Hanukkah this past year, the girls received a large set of loose Lego blocks, and a couple of vehicle kits. They loved the open-ended block set, but the vehicle kits proved to be a bit too much for them without adult help. A lot of adult help.In fact, it seriously reduced their excitement about the Legos, because the adults were having to do most of the assembling. Six-year-olds don’t have that much of an attention span, after all. . So when I was asked to do a review of Lego’s new Lego Juniors line, I was thrilled! . According to the manufacturer, these kits are great for ages 4-7! And they come in different styles – girly, pink, stereotypical “female-oriented” sets, and cool sets with law enforcement and construction themes. . <cough> Make Space/Science themes available!!!<cough> . They sent me the cool sets – A construction digger vehicle, and a police station with car, motorcycle, crook and even a police dog!Halle and Zanna were so excited when we opened up the boxes! . There were several numbered bags of blocks in each set – so that the contents of the bags could be assembled one by one, without having to deal with a huge, confusing pile of mixed blocks! First of all, we looked at the step-by-step instructions. These are so great – they show exactly which parts you need for whichever step you’re at, and how many, and then lead you through the construction process. For the most part, I left the girls to it. This was an excellent skill-building opportunity: reading directions, following an order of operations, observation and troubleshooting as well as fine motor skills, collaborating and cooperation. Whenever they had a problem, they’d ask for help and I’d tell them to go back a couple steps in the directions and observe the picture and their own project. Compare the two – are there any differences? Both of the girls were so excited to work on these sets that they started fighting over who would get to do what step, so I made them take turns. Halle would do one step and Zanna would do the next, and so on. When they had finally completed their projects, the girls played with them, creating little stories and having such a good time that they barely even knew I existed (freeing me up to get other things done). By bedtime, they still wanted to play on with their new Lego sets, Halle even wanted to have some in bed with her (no! ), and the very next morning, we were almost late for school, because I couldn’t get the girls to stop playing with them! And as soon as school was done – they were eager to get home and play some more! So I leveraged – get ALL your homework done first, and THEN you can play with the Legos again. Introduce your child to the fun of building with LEGO Juniors – our new range of Easy to Build sets for children ages 4-7. These quick and easy builds will give your child a feeling of accomplishment and provide hours of imaginative fun. 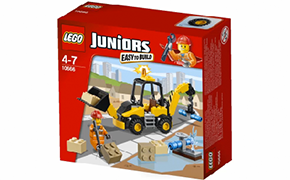 Hit the streets and repair the burst water pipe with the Easy to Build LEGO Juniors Digger. Use the bucket to dig down and the crane to lower the pipe into position! This iconic and Easy to Build set makes a great gift item as it is packed with cool details like the water pipes, valve and of course the Digger and its driver. It’s lots of fun and makes a great way to grow your child’s building skills. Includes a workman minifigure. There’s been a breakout down at the town prison. One of the crooks has been able to escape and now he’s on the run! Give chase with the motorbike and police car then return him to the police station and back behind bars where he belongs! 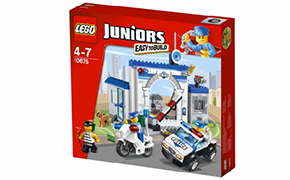 The fantastic Police – The Big Escape set is a great way to introduce your young builder to LEGO brick building. It makes a great gift set, too. Includes 3 minifigures with assorted accessories: 2 policemen and a crook. *I received the products mentioned above from House Party’s Chatterbox program to facilitate this review. All opinions expressed herein are my own and do not necessarily reflect those of House Party or Lego.